Similar to the conventional MDX, the 2019 MDX Sport Hybrid features a number of enhancements, including driver and front-passenger 4-way power lumbar support (up from 2-way), authentic Desert Olive Ash wood highlights, high-contrast seat and door panel stitching, and matching wood center console trim for Advance Package models. Technology and Advance grades include unique interior trim, exterior badging and stainless steel sport pedals. Technology Package models include seating for seven, while the range-topping Advance Package incorporates a 6-passenger interior configuration with second-row captain’s chairs and a large second-row center console in place of a three-occupant bench seat. Engineered for customers who desire the ultimate in driving refinement, technological sophistication and prestige, the MDX Sport Hybrid’s 3.0-liter, i-VTEC™ V6 engine and three-motor Sport Hybrid Super Handling-All Wheel Drive™ (SH-AWD®) system delivers decisive power and control as well as instant torque. Despite turning out 321-peak horsepower and 289 lb.-ft. total peak torque, all MDX Sport Hybrids receive an impressive EPA combined fuel economy rating of 27 mpg2. An advanced 7-speed dual-clutch transmission (7DCT) is standard – a feature closely related to the NSX supercar’s 9-speed DCT. Unlike a conventional automatic transmission, MDX Sport Hybrid’s DCT offers ultra-fast gear changes and operates without the need for a torque converter, significantly improving efficiency. The 7DCT can operate automatically or manually via steering wheel-mounted paddle shifters. The MDX Sport Hybrid’s electric SH-AWD® system operates independently of the gasoline engine, as the two rear-mounted electric motors dynamically apportion torque directly to the rear wheels. When cornering, the MDX Sport Hybrid delivers positive torque to the outside rear wheel, much like mechanical SH-AWD®, to create a yaw moment. In addition, the Sport Hybrid SH-AWD® can simultaneously apply regenerative brake torque to the inside rear wheel during cornering to further enhance cornering control. Every 2019 MDX includes the AcuraWatch™ suite of advanced safety and driver-assistive technologies as standard equipment. AcuraWatch™ bundles together Collision Mitigation Braking System™ (CMBS™) with Forward Collision Warning (FCW), Lane Keeping Assist (LKAS), Adaptive Cruise Control (ACC with Low-Speed Follow) and Road Departure Mitigation (RDM) with Lane Departure Warning (LDW). 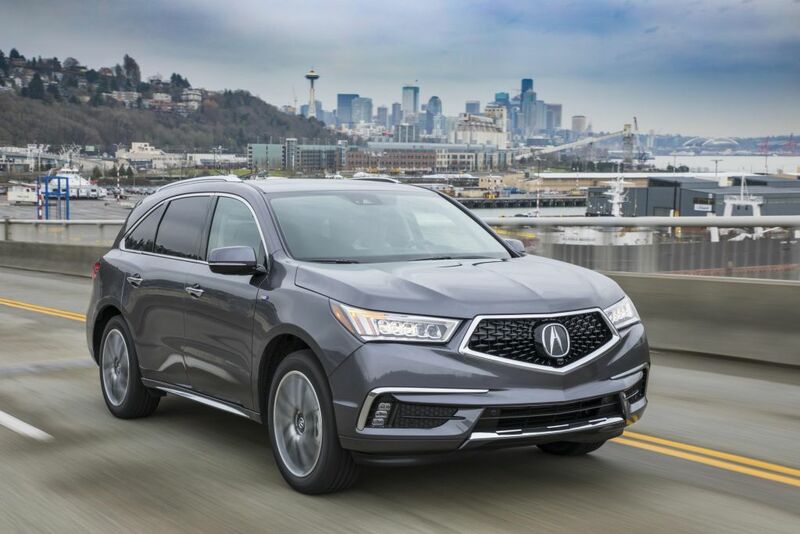 Additional safety and driver assistive features consist of Vehicle Stability Assist™ (VSA®) with traction control, Blind Spot Information (BSI), Rear Cross Traffic Monitor and Acura’s Advance Compatibility Engineering™ (ACE™) body structure. Along with every other version of MDX, the 2019 MDX Sport Hybrid is manufactured exclusively at Honda’s East Liberty Auto plant located in East Liberty, Ohio using domestic and globally sourced parts.